Marysville Pilchuck High School, north of Seattle. In October 2014, a freshman shot five students in the cafeteria, visible in the background. It has been locked and off-limits since the shooting. The Parkland shooting last month has energized student activists, who are angry and frustrated over gun violence. But it's also contributed to the impression that school shootings are a growing epidemic in America. "Schools are safer today than they had been in previous decades," says James Alan Fox, a professor of criminology at Northeastern University who has studied the phenomenon of mass murder since the 1980s. Fox and doctoral student Emma Fridel crunched the numbers, and the results should come as a relief to parents. First, while multiple-victim shootings in general are on the rise, that's not the case in schools. There's an average of about one a year — in a country with more than 100,000 schools. "There were more back in the '90s than in recent years," says Fox. "For example, in one school year — 1997-98 — there were four multiple-victim shootings in schools." Second, the overall number of gunshot victims at schools is also down. According to Fox's numbers, back in the 1992-93 school year, about 0.55 students per million were shot and killed; in 2014-15, that rate was closer to 0.15 per million. "The difference is the impression, the perception that people have," Fox says — and he traces that to cable news and social media. "Today we have cell phone recordings of gunfire that play over and over and over again. So it's that the impression is very different. That's why people think things are a lot worse now, but the statistics say otherwise." Other experts agree. Garen Wintemute is an emergency room physician who leads a prominent gun violence research program at the University of California, Davis. He says school shootings, specifically, are not epidemic. "Schools are just about the safest place in the world for kids to be," Wintemute says. "Although each one of them is horrific and rivets the entire nation for a period of time, mass shootings at schools are really very uncommon, and they are not increasing in frequency. What's changed is how aware we are of them." But Wintemute believes mass shootings — whether in schools or elsewhere — are increasing social pressure to address the far more common threat of small-scale shootings, which mostly happen in private. "For school-age kids, the kind of shooting we most need to worry about is the kind of shooting that occurs off the school grounds," Wintemute says. "The best way to prevent school shootings is to prevent shootings in general." He endorses broader gun safety measures, such as "red flag" laws, which give authorities the ability to remove firearms temporarily from people deemed to be threatening violence to themselves or others. Wintemute and Fox say that by focusing so narrowly on school shootings, we run the risk of turning schools into fortresses. Fox says, given the statistics, it's misguided to put kids through metal detectors and active shooter drills, and he doesn't like the new calls for armed teachers. "Most adults wouldn't want their workplaces to look like what some of the schools are looking like, now," Fox says. But the perception of danger puts school administrators in a difficult position. 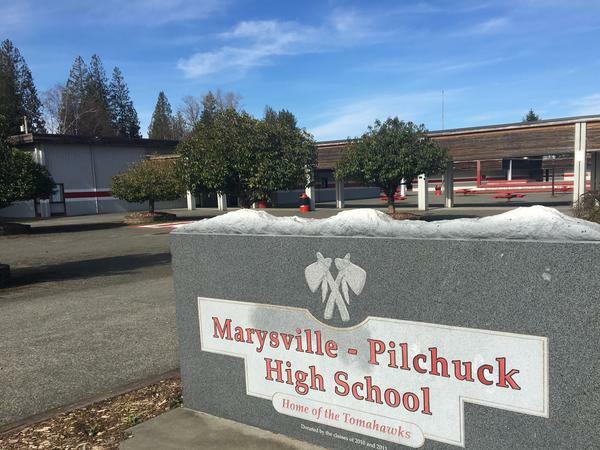 Marysville Pilchuck High School, about an hour north of Seattle, has experienced the tragedy of a shooting, and the statistical rarity is no comfort. On Oct. 24, 2014, a freshman shot five other students in the cafeteria, killing four, before killing himself. Ever since, administrators have struggled to restore the students' sense of safety. "Probably, every day it pops into your head at one time or another," says acting district superintendent Jason Thompson. "You think, 'Okay, we've had our shooting,' right? It's human to think that way. But I think a lot of times for me, it's like, 'This could happen again.'" For the last three years, the district has wrestled with how to make schools safer, without going overboard. Local voters defeated a bond levy which would have remodeled the open-style campus into a more secure, single-entrance configuration. So the school remains very open. There's a new security camera, a security guard near the entrance, and visitors are told to wear a badge on campus, but there are no new fences or metal detectors. Greg Dennis, who runs security for the district, says it's hard to reach consensus on what precautions to take. "From a parent's perspective, they say, 'Holy cow, why aren't we doing this? Why aren't we building prisons, why aren't we building moats?'" Dennis says. "And the next person says, 'We can't do that! This is public property, you have to make it accessible, how do we use the playgrounds on the weekend?'" Without the money to rebuild the school, administrators have opted to emphasize training and preparedness. They try to think tactically — for instance, since the shooting in Parkland, they've been reconsidering how to conduct fire drills, to make kids less of a target to potential attackers as they leave their classes. But Marysville staffers also try to keep the risk in perspective. Dennis says he tries to learn security lessons from other shootings, but he doesn't want to obsess about them. Madysen Pruss, who's part of a federally-funded counseling program at the school, says that's also her message to students when another shooting is in the news. "We talk about how it's publicized through social media," Pruss says. "So it makes the threat feel greater than it is." This year's seniors were freshmen when the shooting happened, so this is the last class that still has memories of the incident. Senior Olivya Cerdinio is one of a group of students who organized the school's observance of the 1-month milestone since the shooting in Parkland. "I'm like kind of done being sad about it, and I'm just really mad about it, and I want to make a change," she says. But it's shootings in general that she's mad about — not school shootings in particular. "It's not dangerous because of how schools are," Cerdinio says, "but because a shooting can happen anywhere. It's more about gun availability." The school walkouts that happened yesterday around the country channeled an intense feeling of anger and frustration for a lot of young people. A month after 17 people died in the Parkland, Fla., shooting, students walked out of class in more than 3,000 schools across the country by one estimate. So now it's been a month that the shooting has dominated national headlines. And NPR's Martin Kaste says there is a disconnect between the perception of danger in American schools and the reality. MARTIN KASTE, BYLINE: James Alan Fox is a criminology professor at Northeastern University in Boston, where he researches mass murder. And when it comes to school shootings, he wants us all to take a deep breath. JAMES ALAN FOX: Schools are safer today than they had been in previous decades. KASTE: He's analyzed the numbers and found that fewer kids are being shot and killed in schools now than a generation ago. If you're counting the number of mass shootings in schools, well, he says that number has also been higher. FOX: There were more back in the '90s than in recent years. For example, in one school year in 1997-'98, there were for multiple-victim shootings in schools in one academic year. KASTE: Fox says there's no denying the horror of the 17 deaths in Parkland last month, but he says anxious parents should keep in mind that there are well over 100,000 schools in this country. And the likelihood of this happening in your school is tiny. Still, statistics are cold comfort when it does happen to your school. Take Marysville Pilchuck High, about an hour north of Seattle. At the end of the school day, kids stream past the locked doors of the old cafeteria. It's been off limits since 2014, when a freshman shot five students there. Four of them died, and he also killed himself. KYLA MORRISON: It just feels very, very kind of dark. Like it's scary to be able to walk by there and have those flashbacks. KASTE: Kyla Morrison (ph) was a freshman that year. Now, she's a senior. There's a brand-new lunchroom at the school. They call it the commons to avoid that dreaded word cafeteria. But still, she says, a lot of kids would rather not eat there. KYLA: They eat in teachers' classrooms. And they like to be with the people who make them feel safe. KASTE: Making students feel safe is a big part of the job for acting school Superintendent Jason Thompson. JASON THOMPSON: Probably every day it pops into your head at one time or another, whether it's a fire drill and how to react to that or a teacher that you learn is out on medical leave because of PTSD from the shooting. KASTE: He knows students are far more likely to fall victim to other kinds of threats - drugs, suicide, sexual violence. But that doesn't let him off the hook when it comes to worrying about this. THOMPSON: You think, OK, we've had our shooting, right? I mean, it's human to think that way. But a lot of - I think a lot of times, for me, it's like, this can happen again. KASTE: So when shootings happen elsewhere, the administrators pay attention, trying to learn new security lessons. But at the same time, the counselors here tell the students not too obsessed with those other shootings. They remind the kids that 24-hour cable and social media have a way of amplifying other tragedies. At Northeastern University, James Alan Fox says modern media are a big reason that people think school shootings are on the rise. FOX: We just have much more coverage of the events in a very graphic way. Today, we have cellphone recordings of gunfire played over and over and over again. So it's - the impression is very different. That's why people think that things are a lot worse now, but the statistics say otherwise. KASTE: Other experts agree. Dr. Garen Wintemute is director of the newly-created University of California Firearm Violence Research Center. GAREN WINTEMUTE: Whether it's school shootings or public mass shootings in general, we grossly overestimate that risk. KASTE: Wintemute says media coverage is part of the reason, but he also points to the indiscriminate nature of this kind of violence. WINTEMUTE: Public mass shootings, school shootings included, are the one form of firearm violence about which no one can tell a story that leaves them and their loved ones out. KASTE: Both Wintemute and Fox warn against letting this fear take over, say, by turning schools into fortresses. And at Marysville Pilchuck, they have resisted that temptation. The school is still a welcoming place. Yes, there's a security guard, but it's still an open-plan campus with no big new fences, no metal detectors, no armed teachers. One of the students here, Olivia Serdinio (ph), says school shootings are not what she's worried about - it's shootings in general. OLIVIA SERDINIO: I think that like it's not dangerous because of how schools are but - because a shooting can happen anywhere - it's just more about gun availability. KASTE: She and Kyla Morrison helped to organize the anti-gun violence walkout here yesterday, and they say they're going to keep pushing that issue after they graduate and leave behind this school and that locked cafeteria. Martin Kaste, NPR News, Marysville, Wash. Transcript provided by NPR, Copyright NPR.